This Sunday in Albert Square, Manchester, a beautiful and enormous articulated figure, called 'Arthur', will be decorated with the results of a live pain survey. Suspended within a 7m high rig, and animated by talented aerial artists from The Circus House, Manchester, a visual spectacle and performance will explore the impact and the prevalence of pain. My role in this bizarre extravaganza has been as designer and creator of 'Arthur', and creative collaborator with The Circus House, a local community circus company. Day for the past 6 years, initially as a member of the community, and then as an artist in my own right, working for the past three years with The Circus House. Each year Manchester Day takes a new theme, which we can interpret in wild and wonderful ways. This year it's 'Eureka', and the aim has been to connect artists, communities and scientists, as we celebrate Manchester as European City of Science. This year, around the end of April I took an intriguing call from the event designer Candida Boyes of outdoor production company Walk the Plank. Would I be interested in a project involving a giant pain mannequin, The Circus House and Dr Will Dixon from the University of Manchester? At the time, I had just returned from a trip to Athens where I had been very excited by classical figurative sculpture of impressive scale, and so I said 'yes'. The process from there was surprisingly straightforward. The 'Cloudy' team presented us with a very clear objective of collecting data from the public and displaying it on a mannequin. 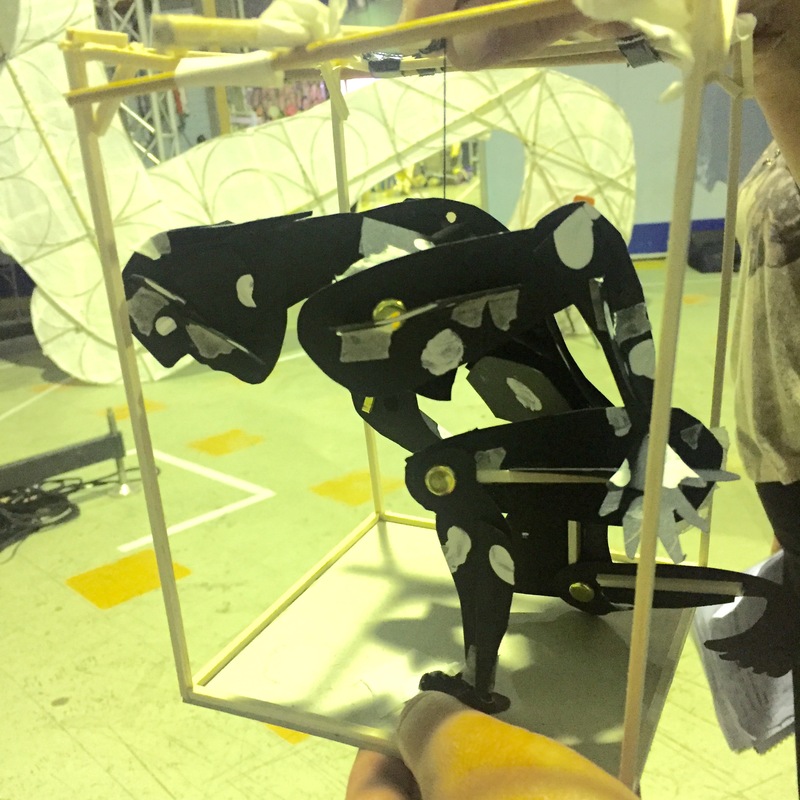 The Circus House told me about the aerial skills they have been training in, which involve counter weights which allow them to 'fly' through space, and we knew this was the best way to animate the event. To do this they needed a large square rig, 7M high. We agreed I needed to suspend a giant man within this frame. The frame would act as a metaphor for pain, with the figure trapped within it. With Greece in mind I looked at classical sculpture. I wanted the figure to be dynamic, filling the frame, to emphasise his being physically trapped. 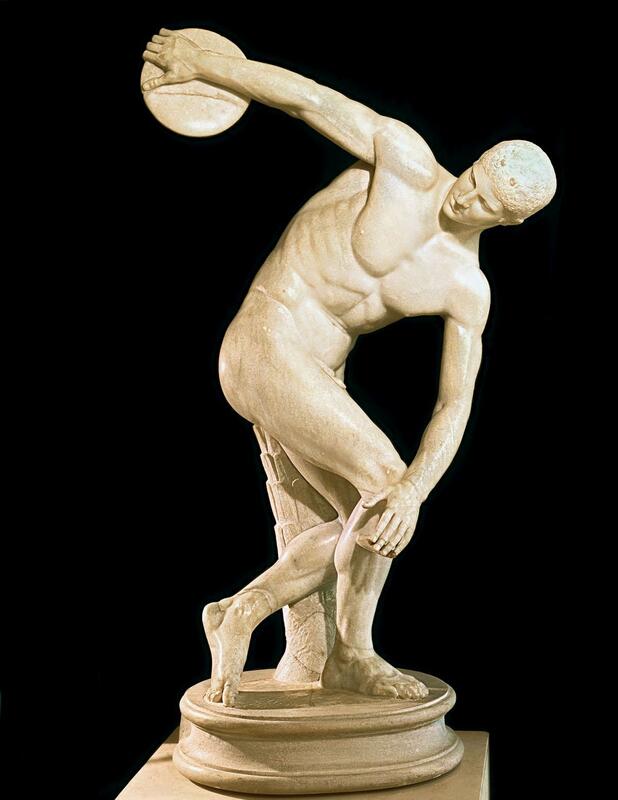 There is a famous Greek statue, known as The Discus Thrower (see below), which captures the rhythm and athletic energy of a moment of physical exertion. This seemed perfect. Our man would be trapped in this moment, unable to progress, to achieve his physical goal. For the style, I looked at Picasso, an artist whose work is a constant reference for me. The cubist style would enable me to build something big and impressive, which on the day would be relatively quick to assemble, which is a huge consideration. And so, from the comfort of my studio, a scale model emerged, and to my delight, and relief, everyone loved it. Once the figure had a form, I immediately knew he had to have a name. We couldn't keep referring to him as a nameless mannequin. Like the invisible suffering he describes, he needed a name to become real. It had to be 'Arthur', readers of the children's novel 'Skellig' by David Almond will know why. Meet Arthur and performers from The Circus House in 'Come Pain or Shine' in Albert Square, Manchester and take part in our live pain survey. Thanks to the many volunteers from the University of Manchester who have joined the production team at WOW, glueing, painting and cutting. This is what Manchester Day is all about.